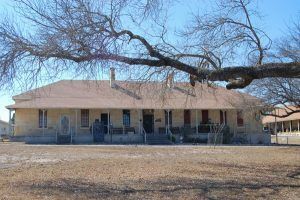 Fort Clark (1852-1946) – Unlike many other forts prominent in the Indian Wars, this fort in south-central Texas remained an active post through World War II. It was founded in 1852 and inactivated in the mid-1940’s. The southern anchor of the Texas defensive line in the 1850’s, it guarded the San Antonio-El Paso Road and policed the Mexican border. In 1849, when Lieutenant William H. C. Whiting was surveying a practical route between San Antonio and El Paso, he recognized the site of Las Moras Springs, at the head of Las Moras Creek, as an ideal location for a fort. 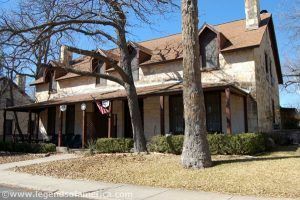 The U.S. Army took his advice, and established Fort Clark on June 20, 1852, with an objective of protecting the San Antonio-El Paso Road and protecting area settlements from both Indians and threats from Mexico. The land was leased for the fort and Companies C and E of the First Infantry under the command of Major Joseph H. LaMotte, who, along with an advance and rear guard of U.S. Mounted Rifles, began to construct the fort. By 1853, the soldier’s barracks were nearly completed and in 1854, three officers’ quarters were built. In 1855 a stone hospital and a two-story storehouse were erected. Within no time, a settlement sprang up around the fort, beginning when Oscar B. Brackett established a stage top and opened a dry-goods store. When the settlement was first founded in 1852, it was called Brackett, but, was later renamed Brackettville. Even though the fort was just south of the community, the town grew slowly because of the constant Indian threats. In 1861, at the onset of the Civil War and the secession of Texas, Federal soldiers abandoned the fort in March 1861. The Confederates moved in and was occupied by the Second Texas Mounted Rifles until August 1862. It was then used briefly as a hospital for Confederate troops and area civilians. Union soldiers returned in December 1866, next involved in numerous Indian Wars. In 1872, Fort Clark was home to numerous black Seminole Indian Scouts, who would serve the fort from 1872 until 1914. Many infantry units and virtually all cavalry units, including the 9th and 10th “Buffalo Soldiers,” were stationed at Fort Clark at various times. During these tumultuous years, Comanche and Apache Indians often swept through the area, raiding, killing, stealing horses, mules and cattle before escaping across the Rio Grande River into Mexico. At the same time, outlaws were busy working their dastardly deeds in the area, before fleeing the border to safety of Mexico. During these violent times, hundreds of pioneers were forced to abandon their homesteads. 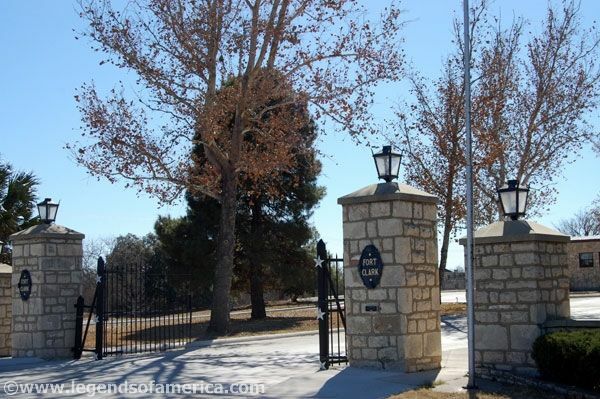 In 1873, the fort was the headquarters of Colonel Ranald S. Mackenzie when he created an international incident by crossing the border and attacking the Kickapoo and Lipan Apache raiders who were using Mexico as a sanctuary. The troops also played a small role in the Red River War of 1874-75. After the Indians in the region were subdued, the fort was threatened with closure, but, turmoil along the border due to the Mexican Revolution revitalized the military need for the fort. During the Spanish-American War, Fort Clark was garrisoned by the Third Texas Infantry in 1898. The fort remained active as an infantry and cavalry post, with troops serving in World War I. During the Second World War, the fort was a cavalry training center, manned by the 112th Cavalry and the Texas National Guard Unit. More than 12,000 troops of the Second Cavalry Division trained at Fort Clark until their deployment in February 1944. During the war, the post also served as a German POW camp. Soon, technological advancements signaled the end of the horse cavalry. Fort Clark was one of the last horse-cavalry posts in the country. The post was officially deactivated in early 1946, and later that year was sold to the Brown and Root Company for salvage and later used as a guest ranch. For the preservation of Fort Clark, its use as a guest ranch ensured its preservation. In 1971, the property became part of the Fort Clark Springs Association, which has developed the area, providing not only a living and resort community but also preserving some 80 buildings that have been designated as a National Register Historic District. The old cavalry barracks have been transformed into a hotel. Inside the old guardhouse is a museum, operated by the Fort Clark Historical Society, which is open on weekends. Today, approximately 25 to 30 buildings dating from the 19th century have survived, including two sets of officers’ quarters and another log building, which date to the early 1850’s. Other buildings, constructed of stone, were built from the late 1850’s to the 1880’s. These include officers’ quarters, barracks, commanding officer’s house, quartermaster storehouse, and guard house. Called Fort Clark Springs today, the old fort site is a privately owned resort and leisure living community. However, its being a commercial endeavor has only helped in the preservation of this historic fort. The resort includes an 18-hole golf course, and the old Fort Clark spring feeds a natural swimming pool. Camping and RV sites are available. 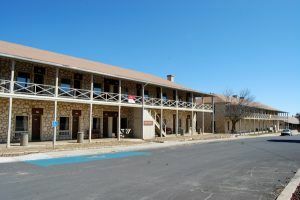 Fort Clark Springs is located at the southern edge of Brackettville, Texas.